The item I would like to purchase shows “Out of Stock” quantity. How do I go about ordering one? Most product pages have a form underneath the description. By filling out this form, we are able to get in touch with you to get the specifics of your request and put you on a waiting list to receive the product as soon as we get it in stock. In the near future there will be more availability on the products, but for the time being most swords and anything customizable is currently made to order. How long can I expect to wait once I place an order through a form on your website? Depending on the product you’ve requested, the turn around time is usually a few weeks. Custom swords can take longer. We are proud to share that the majority of our customers are very happy with the speed their order arrives. 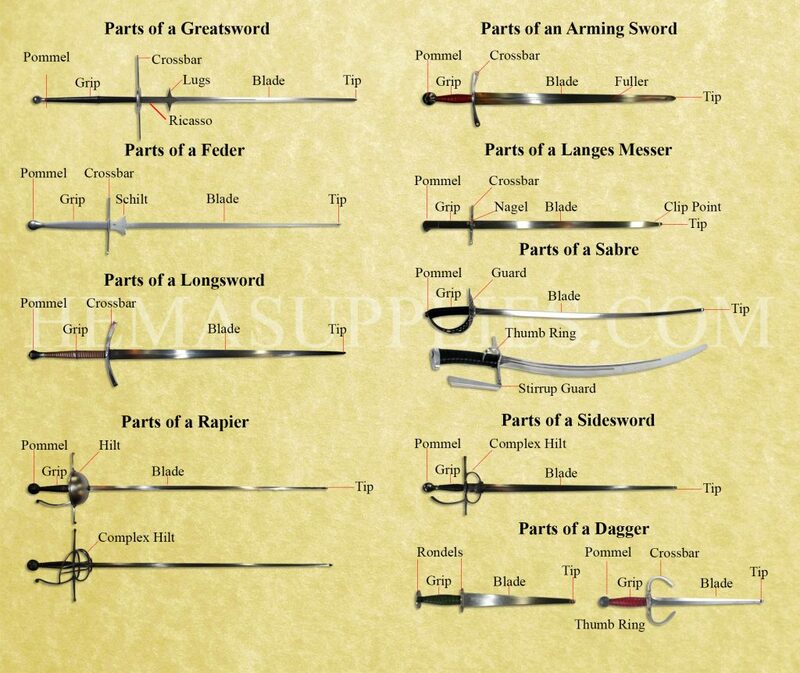 Here is a graphic we whipped up to share some of the terminology we use to describe parts of the swords we sell. Some of the terms may not be the most common reference to a part, but will be used specifically for the ordering process.